Where is the place of action? 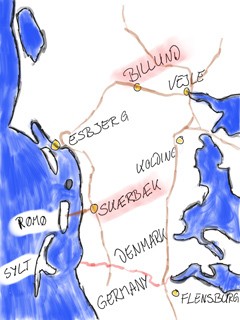 Skærbæk is located just 80 kilometers south of Billund, the heart of LEGO! And it has the skærbækntret that means two big exhibition halls and more than 80 cosy cottages! No need for a car, AFOLs where ever you go - the entire weekend! Well, Skærbæk is not København so basically a car is very handy. But at least it&apos;s not impossible to use public transportation. From Billund you have to take the bus to Esbjerg. In Esbjerg you have to switch to the train to Skærbæk. Arrived at Skærbæk you have to walk across the entire city to the other end. This won&apos;t take longer than a couple of minutes. Be prepared that the trip will last approximately 3 hours (+/- 30 minutes). For car sat-nav please use the address below. Booking of cottages and meals has to be done directly at skærbækcentret via e-mail. It&apos;s not possible to book via Phone. The below meals are booked and paid directly to skærbækcentret when booking your cottage. No adjustments can be made to the meal bookings later than two weeks before the event. If ordering special meals a fee of 20 DKK will be added per meal order. Exceptions from this are regular vegetarians and diabetics. It is not allowed to bring own food or drinks to the entire skærbækcentret. Coffee, tea and water will be available in the LUG Lounge. All meal tickets have to be collected at the reception. All meals can be ordered seperately and will be served at the restaurant (first floor). In total there are 81 cottages full of AFOLs! All of the cosy cottages have 6 beds. WiFi & Electricity is free of charge from Friday to Sunday. Price for cottages does NOT include bed linen and end cleaning. If all cosy cottages are sold out (and they are going away quite fast) you might want to book via Sol-og-Strand. Look out for holiday housees on Rømø near to the beach, or in Arrild. Arrild is just 14km to drive and you&apos;ll find a lot of houses located in the same area for a reasonable price. And even better: all participants will recieve 10% discount. Please refer to the forum to get the promotion code. More alternaitves can be found at the Skærbækcentret site. Food, or dinner tickets can be ordered via the skærbækcentret even if you are staying somewhere else.